May 4, 2016 – Venus flytraps have fascinated biologists for centuries, however, the molecular underpinnings of their carnivorous lifestyle remain largely unknown. In a study published online today in Genome Research, researchers characterized gene expression, protein secretion, and ultrastructural changes during stimulation of Venus flytraps and discover that common plant defense systems, which typically protect plants from being eaten, are also used by Venus flytraps for insect feeding. Venus flytraps recognize their prey using touch-sensitive trigger hairs located on the trap's inner surface. When stimulated, these hairs generate an electric signal that is transmitted to the plant. After the first stimulus, the trap remembers the signal but does not close; after the second stimulus, the trap snaps shut. Prey that is captured will repeatedly activate the trigger hairs leading to repetitive electrical signals "remembered" by the plant. To date, no carnivory-specific genes have been identified in Venus flytraps. To understand the molecular pathways involved in insect feeding, researchers from Germany and Saudi Arabia generated genome-wide transcription profiles of traps before and during feeding and compared them to other plant tissues. Unstimulated traps have gene expression patterns that largely resemble that of a leaf base, supporting the common assumption that traps are modified leaves. However, the glands inside the trap, which promote insect digestion, more closely resemble the expression pattern of roots, a tissue heavily involved in nutrient uptake. Image: A potential meal stimulates the touch-sensitive trigger hairs inside a Venus flytrap. Photo credit: Sönke Scherzer. The researchers found that insect-stimulated traps upregulated enzymes involved in digesting prey and also transporters for nutrient uptake. Tracking the expression patterns of several hydrolases, the researchers determined that hydrolase expression was induced within 1-2 hours of touch stimulation, and a second stimulation event (mechanical or chemical) further amplified expression of chitinase, an enzyme that digests chitin in insect exoskeletons. "Contact with chitin normally means danger for a plant – that insects will eat the plant," corresponding author Rainer Hedrich from the University of Würzburg said. Comparing the global gene expression changes during insect capture and digestion to the stress response of the model organism, Arabidopsis, the researchers found several commonalities. Jasmonic acid (JA), which is produced by non-carnivorous plants when they are wounded by herbivores, is upregulated in insect-stimulated traps. "In the Venus flytrap, these defensive processes have been reprogrammed during evolution. The plant now uses them to eat insects," Hedrich said. 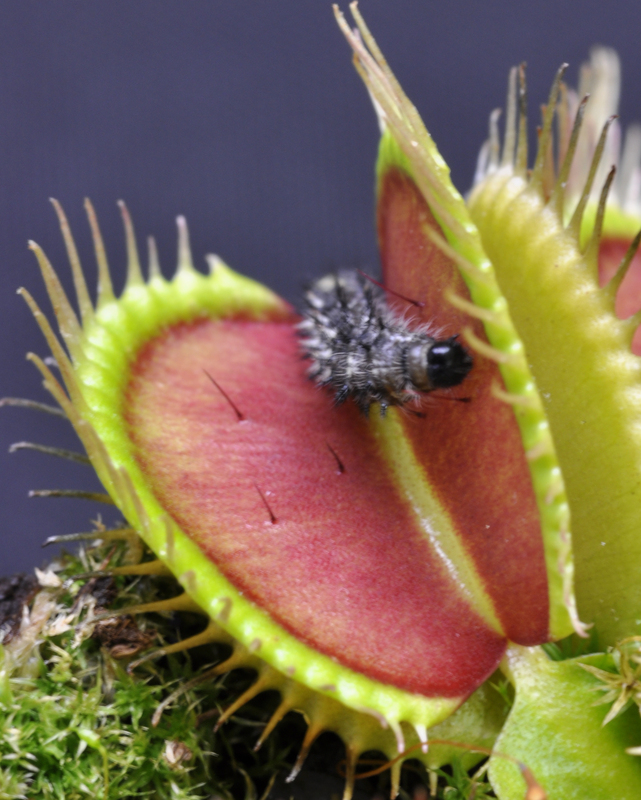 Unstimulated and stimulated traps both express receptor-like-kinases (RLKs), which are used in chemical sensing in non-carnivorous plants, suggesting Venus flytraps may be able to detect chemical changes related to prey capture, in addition to touch sensitivity. Of the upregulated transcripts that were predicted to be secreted, the researchers were able to confirm all were actively secreted using proteomic screening of the flytrap's digestive fluid. The researchers also used electron microscopy to study the ultrastructure of the trap's glands, finding specialized cell layers involved in active secretion, nutrient transport, lipid energy stores, and protein biosynthesis necessary for trap function. Scientists from University of Würzburg, University of Hohenheim, King Saud University, the Max-Planck-Institute for Chemical Ecology, and Heinrich-Heine-University Düsseldorf contributed to this study. The study was funded by the European Research Council, King Saud University, and the German Excellence Initiative. Interested reporters may obtain copies of the manuscript via email from Peggy Calicchia, Administrative Assistant, Genome Research (calicchi@cshl.edu, +1-516-422-4012). Launched in 1995, Genome Research (www.genome.org) is an international, continuously published, peer-reviewed journal that focuses on research that provides novel insights into the genome biology of all organisms, including advances in genomic medicine. Among the topics considered by the journal are genome structure and function, comparative genomics, molecular evolution, genome-scale quantitative and population genetics, proteomics, epigenomics, and systems biology. The journal also features exciting gene discoveries and reports of cutting-edge computational biology and high-throughput methodologies. Genome Research issues press releases to highlight significant research studies that are published in the journal.